If you want to camp on the beach in California, you might think it would be easy to find a place to do it. After all, California has 840 miles of coastline on the Pacific Ocean and plenty of beaches. The truth is that finding that perfect spot near the sand and surf is harder than you think. Part of the coast is rocky with steep cliffs and no beaches. Part of it is taken up by big cities. Other parts are protected for environmental reasons. That doesn't leave many places to go. Beach campgrounds aren't always what you expect them to be. Unfortunately for the unsuspecting camper, some places add the word "beach" to a campground name in an attempt to get attention. Sadly, they may be so far away from the ocean that you might need to take a photograph back to your campsite just to remember what the beach looked like. If you're looking for beach camping in California, you want your campsite to be right on the beach or next to it. A place on the cliff above the ocean, across a busy road from the beach, or so far away you'd need binoculars to see the sand doesn't qualify for this guide. 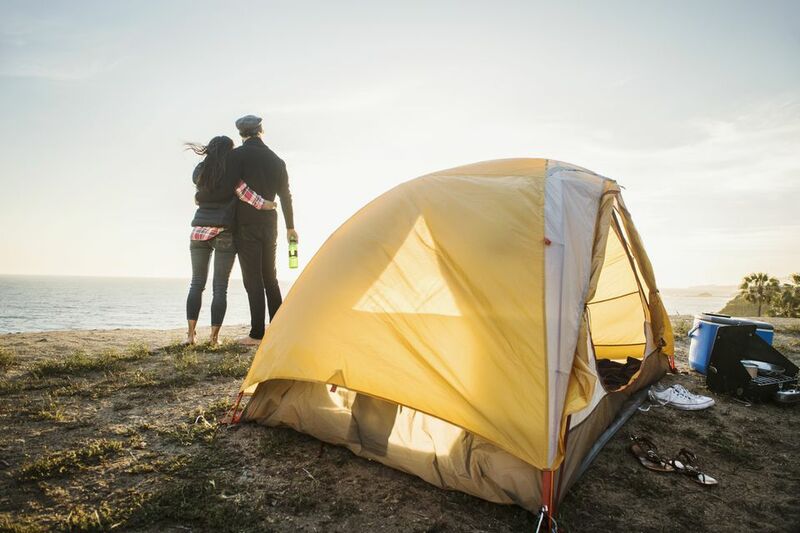 To help you find the best places for beach camping in California, use the lists of beach campgrounds below to plan your trip. Every place on the lists below meets strict requirements. They are all next to the ocean, or just a short walk away and you won't have to brave traffic when you make that walk. In addition, all the campgrounds in the guides below have been visited and checked, just to be sure they are what they claim to be. Starting in southern California and working north, here are the best places for beach camping anywhere along the California coast. Southern California Beach Camping: You might expect to find quite a few places for beach camping in sunny Southern California, and you'd be right. What might surprise you is that some of them are actually in the middle of busy urban areas. Ventura County California Beach Camping: Just north of Los Angeles, Ventura County is the place to go if you have visions of setting up your RV parked right next to the ocean. You'll also find some beautiful campgrounds where you can pitch your tent at the beach. Santa Barbara California Beach Camping: You'll find a few places to camp close to the beach near Santa Barbara, but don't expect to set up your camper and walk into town for dinner. Most of them are quite a few miles away. Central Coast California Beach Camping: Between Santa Barbara and Big Sur, you'll find the only place in California where you can set up your RV right on the sand - that's in Pismo Beach. You'll also find some beautiful places for beach camping between Morro Bay and Santa Cruz especially the state parks just south of Santa Cruz. Northern California Beach Camping: From Santa Cruz to the Oregon border, you'll only find a few places for camping near the beach, as the coastline grows steeper and rockier - and colder. You don't get much for free these days, and California beach camping is no exception. Every single place that offers proper beachfront campsites charges a fee, even the ones with porta-potties and no running water. Sadly, you may also find incorrect information in some guides. Too many writers copy and paste from one list to another without doing their research. If you see a list that includes a free beach campground near Orick in Northern California, near the freshwater lagoon, it doesn't exist. A State Park Ranger has confirmed that there are no free campgrounds in the Orick area. If you're the kind of person who thinks camping is what people did before God invented hotels, California has a great selection of beach hotels, each of them also right on the sand.